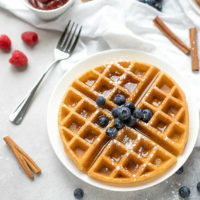 Crispy Belgian Waffles Recipe - warm and crunchy Belgian waffles with a secret ingredient, perfect for breakfast. Quick to make, with a large, deep pockets that hold a lot of syrup or jam. Place all ingredients for the batter, besides the sparkling water in a blender and pulse 3-4 times until batter forms. Add the sparkling water, a little bit at a time, stirring to combine, until you get a consistency, slightly thicker than crepe batter, a consistencu of thin pancake batter. Heat the waffle iron. Spray with cooking spray and immediately add batter, (use the measure that comes with your waffle iron). Cook until golden. Serve immediately.